Different types of ports are discussed starting on page 7 of the textbook. After reviewing the Week 1 course materials, go to the Internet and find a port to use as an example in this assignment. Describe the port you selected to include the type of port as well as the various services, features, terminal operations, berths, dwell time, etc. that the port offers. Include reasons for your selection. Be clear and concise in your discussion. You must include a title page, introduction, conclusion, and reference page. The Port of Montreal is an important hub for the east coast and central U.S. As well as for most of Canada. This port serves the Great Lakes as well as the eastern seaboard. It can handle all types of cargo and is one of the busiest ports east of the Mississippi River. Because of its inter-modal infrastructure, the Port of Montreal has been able t continue growing even under tough economic times. Its sheer size and scope have given it the unique ability to serve the needs of many different types of consumers as well as transportation firms. This is also interesting because the port is located upriver, and traditionally these locations are geographically critical as they generate high amounts of port congestions (Guy and Alix, 2006). However, the Port of Montreal has been able to mitigate this limitation be successfully implementing a very complex and highly-efficient inter-modal transportation system. Special ramps for roll-on/roll-off cargo. These facilities allow the Port of Montreal to operate a multi-modal system of ports throughout the area. That is to say that the Port of Montreal acts as a hub for nearby shipping lanes, airports, seaports, railroads, and roads that help connect it to the millions of consumers in the surrounding area. These facilities also allow the port to handle four main types of cargo, which include containerized cargo, non-containerized cargo, dry bulk cargo, and liquid bulk. This port is an excellent example of strategic intermodal transportation because it serves the needs of many types of cargo consumers and shippers. Some of the cargo is shipped by truck and train, whose infrastructure is tied directly to the port itself. The fact that the Port of Montreal can accept such different types of cargo is a direct testament to the fact that it has been able to build a highly-complex infrastructure of multi-modal transportation systems 9 Guy and Alix, 2006). The Port of Montreal acts as a major transportation and cargo hub for the eastern and central U.S. And Canada. It sees over 12 million metric tones of cargo each year, and has been growing at around 8% per year for the past decade (Port of Montreal, 2010). Even in the face of a global economic recession, this port is an excellent example of a multi-modal port that has remained busy and profitable due to its diversity of cargo and ability to adapt to any cargo or transportation needs. Guy, Emmanuel and Alix, Yann. (2006). "A successful upriver port? Container shipping in Montreal." Journal of Transport Geography. Vol. 15, No. 1. Pp. 46-55. Homepage. < http://www.port-montreal.com/site/index.jsp?lang=en>. Accessed Online August 6, 2010. "Warehousing can be labeled as an indirect derived demand since it is a 'non-movement' of a freight element." (Rodrique, Comtois, Slack, p. 3). Your task is to list and explain as many other indirect derived demand components of a transportation system as you can. Be creative here. Have fun. 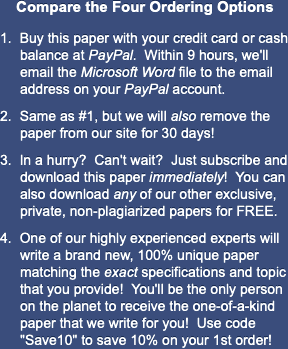 And, be sure to follow the guidelines for Written Papers. Please do read that rubric first! 1. Labor concerns: Ports require large labor forces for direct operations. Without human capital, ports would grind to a halt. One example of this is the recent labor dispute that shut down the Port of Montreal in July (AP, 2010). 2. Infrastructure concerns: these concerns are directly related to the movement of goods and cargo to and from the port. Without a proper infrastructure, a port could not function. 3. Tracking of goods: This is very important for the efficient operation and shipment of goods. Tracking and correctly packing the cargo can have both potentially positive and negative impacts on the efficiency of the port system. 4. Maintenance: Ships and other forms of transportation are in constant need of maintenance and repair. Without these facilities nearby, ports would not be able to function because their modes of transportation would not be functioning either. There are likely dozens of others, but these components make up much of the modern-day port's indirect derived demand components as seen in recent news stories. These components also illustrate the fact that the elements necessary for a port to function smoothly and effectively are many, and that a port manager must have a good understanding of these and other derivative elements that indirectly affect the port's operation. http://www.wtop.com/?nid=111&sid=2006391>. Accessed August 7, 2010. Notteboom, Theo E. And Rodrigue, Jean-Paul. (2005). "Port regionalization: towards a new phase in port development." Maritime Policy and Management, Vol. 32, No. 3. Pp. 297-313. Robinson, Ross. (2002). "Port elements in value-driven chain systems: the new paradigm." Maritime Policy and Management, Vol. 29, No. 3. Pp. 241-255. The text discusses how, "The causes of congestion are well understood, even if the solutions are not." Do you agree or disagree? State your views in terms of transport geography. The causes of congestion at a port are very well understood. Most of these causes, according to lecturer Matthew Malchow (2001) are related to geographic location. This is a problem in trying to solve congestion problems because it is impossible to move a port once it is located in one place. I certainly agree that this problem is far and ahead the largest and most insurmountable of the many that exist in port management and operation. The reason that this is so is because of the difficulty in solving it. The diminishing returns of solutions such as building docks on pilings or even modifying the surrounding landscape tend to create costly and ill-effective returns. Transportation geography is a concern that can be overcome with ingenuity and other, infrastructure and planning-based solutions. If a port that is located in a place where congestion is the norm implements multi-modal forms of transportation, it is more likely to be able to adapt to any adverse geographical or location problems and concerns. For instance, a port that is located on an island may be a suitable place for ships to load and unload as well as fuel up and receive maintenance and repairs, but location a port on an island severely limits the ability to move the cargo to and from the ships effectively. One effective multi-modal solution would be to locate a large airport on the island that is equipped to handle the goods coming and going from the ships. While this may be costly, the benefits of a plan such as this could be weighed against the possible detriments and if the solution makes sense financially and logistically, it could help reduce the general geographically-related congestion at that port. Matthew Brian Malchow, "An Analysis of Port Selection" (July 1, 2001). Institute of Transportation Studies. Dissertations. Paper UCB-ITS-DS-2001-3. Provide a three one-page response, for each the following questions. These two questions are a written paper 2 pages each or combine them together and 4 pages. "Port and Terminal Operations Different." 11 August 2010. Web. 24 April 2019. <https://www.essaytown.com/subjects/paper/port-terminal-operations-different/8285>. "Port and Terminal Operations Different." Essaytown.com. August 11, 2010. Accessed April 24, 2019.